I started this week with a strange craving for a good, fist-sized Cookie with chunks of Toffee. But rather than run out for a bag of Toffee chips, I thought this would be a good excuse to load up on some homemade Butter Toffee. Well, here I am... some 3+ pounds of Butter Toffee later. I guess I will be making a LOT of cookies. Butter Toffee is yet another illustration of the power of Sugar - specifically, the power of Caramel. All it takes is some heat and a little Cream, and you have an amazing Caramel Sauce. If you add even more heat, that Caramel Sauce becomes a sticky Caramel Chew. Forego the Cream and really crank up the heat... then it's a crunchy Brittle. Butter Toffee (surprise surprise), brings Butter to the equation, and the final product highlights the crunch of a good Brittle with the rich, creaminess of a Caramel Chew. Oh, the danger of being able to make candy at home. When there's only 30 minutes between you and pounds of Butter Toffee, life is a state of constant peril! Before starting on the actual Butter Toffee, roast, cool and roughly chop the Peanuts (or whatever type of nut you would prefer). 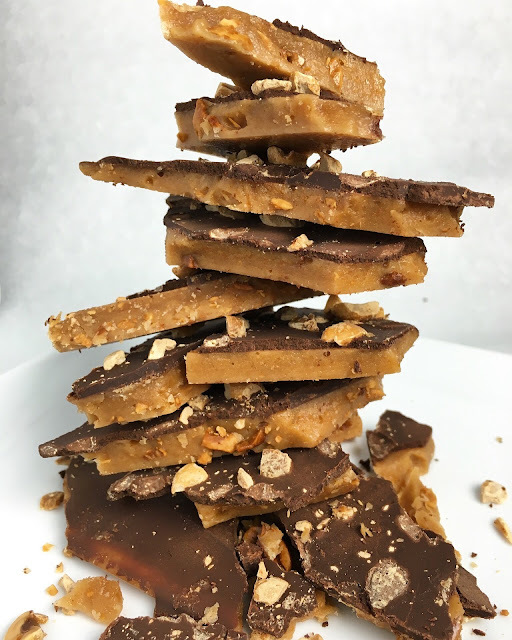 Half of the Peanuts will be mixed into the Butter Toffee, making for a more crumbly, easier to bite texture. The remaining Peanuts will be sprinkled on top of the Butter Toffee after it is coated with Chocolate. Lightly coat the Peanuts in Vegetable or Canola Oil and sprinkle with them salt. Place the Peanuts in a single layer on a parchment lined sheet tray and roast the Peanuts at 350 degree Fahrenheit (177 degrees Celsius) until they become fragrant and begin to brown - approximately 15-20 minutes. When the Peanuts have cooled, roughly chop them in a food processor. Keep a close eye on the Peanuts when they are in the oven. Nuts can quickly go from perfectly roasted to completely burned. Peanuts take longer to roast, but other nuts, such as Almond or Hazelnuts, may roast more quickly. With the roasted Peanut mise-en-place taken care of, it's time to make the Butter Toffee. The process is extremely quick and simple... and not surprisingly, it begins with lots of Butter. When the Butter has completely melted, increase the heat and whisk in the White Granulated Sugar and Corn Syrup, bringing the mixture to a boil. I like recipes that are based on easy to remember ratios. In this case, the weight of the Butter is equal to the weight of the Sugars. As the mixture boils, continue whisking actively to keep the Butter and Sugar from burning or from separating. Continue to heat the mixture to at least the Hard Crack Stage: 300-310 degrees Fahrenheit (149-154 degrees Celsius). Some recipes will suggest that the Butter Toffee will begin to turn deep amber as the Sugar caramelizes. However, Sugar does not Caramelize until around 340 degrees Fahrenheit. The change in color that occurs at this lower temperature is from the milk solids, which start to brown at 250 degrees Fahrenheit. Once the target temperature is reached, remove the pot from the heat and whisk in the Baking Soda and Salt. 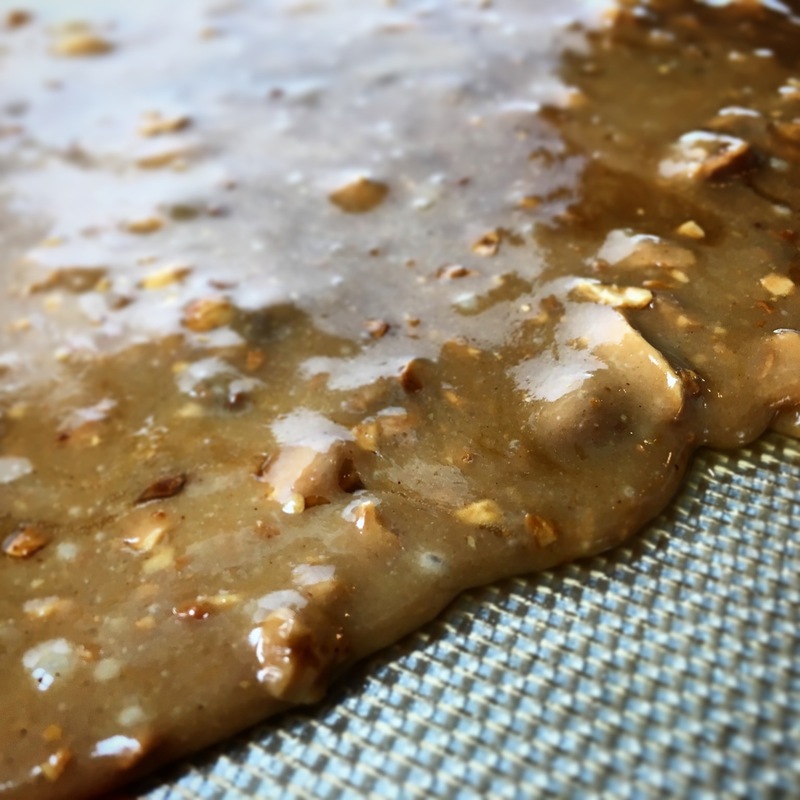 The Baking Soda will react with the hot, Butter Toffee mixture, releasing carbon dioxide and creating tiny bubbles throughout the Butter Toffee. When the Butter Toffee cools and hardens, the tiny bubbles will make the texture more crumbly and more pleasant to chew. As soon as the Baking Soda and Salt are incorporated, stir in half of the roasted Peanuts with a wooden spoon. Attempting to stir the Peanuts into the mixture with a whisk will result in a hard-to-clean mess. Pour the hot mixture onto a sheet tray lined with a silpat in a thin, even layer (you can also line the sheet tray with parchment paper that has been lightly coated with non-stick spray). Do not attempt to spread the liquid Butter Toffee mixture after it has been poured. You will pop the bubbles formed by the Baking Soda. The Butter Toffee will set in about an hour, becoming hard and brittle as it cools. 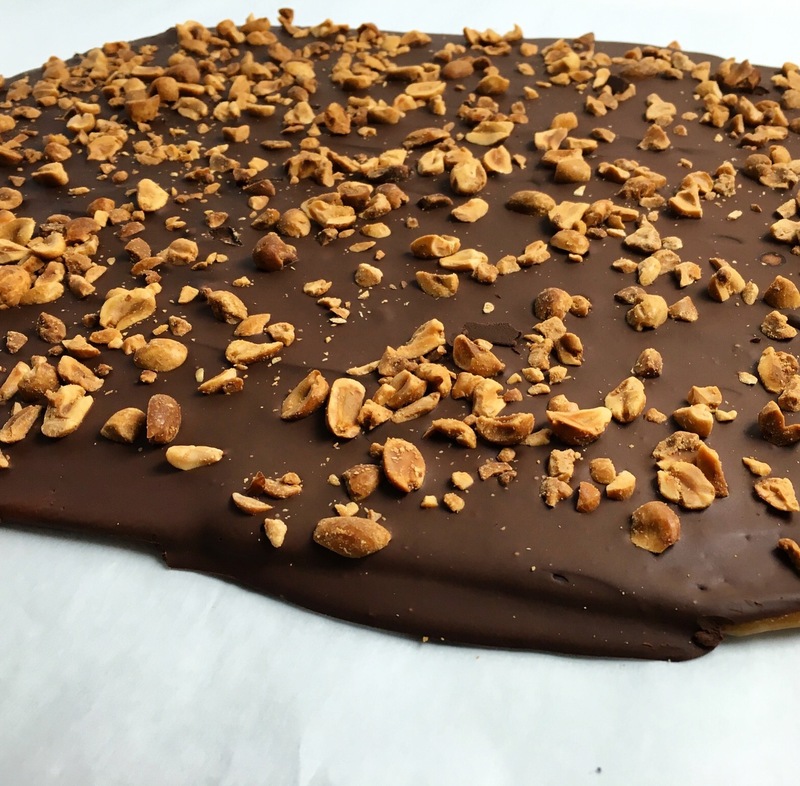 You can break the slab of Butter Toffee into pieces at this point, or you can finish the candy with a coating of Chocolate and more of the roasted Peanuts. Once the Butter Toffee has cooled, temper the Chocolate. Using an offset spatula, spread the tempered Chocolate in a thin, even layer of the surface of the Butter Toffee. Before the Chocolate sets, sprinkle the surface with the remaining roasted Peanuts. Place the coated Butter Toffee aside to set. For those not up to the challenge of tempering chocolate, it is possible to use good-quality Chocolate that has been gently melted over a double boiler. Melted but untempered Chocolate will not set with the same shine or have the same smooth texture as well-tempered Chocolate. It may also remain "tacky" at room temperature, making refrigerated storage necessary. However, particularly if you are planning to eat the Butter Toffee shortly after it is made, this is a perfectly acceptable alternative. 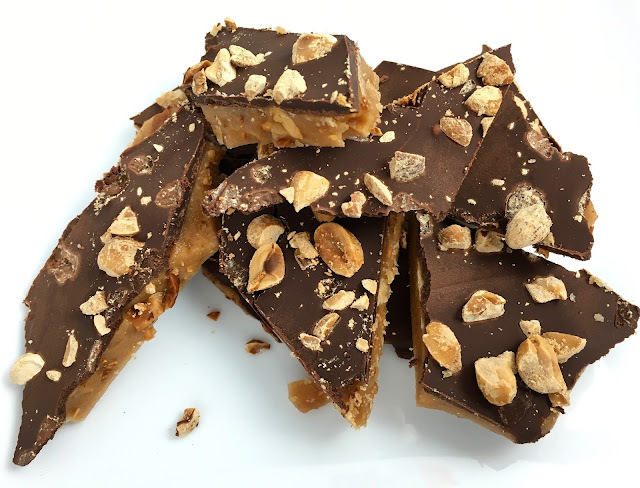 When the Chocolate has set, break the Butter Toffee into bite-sized pieces. 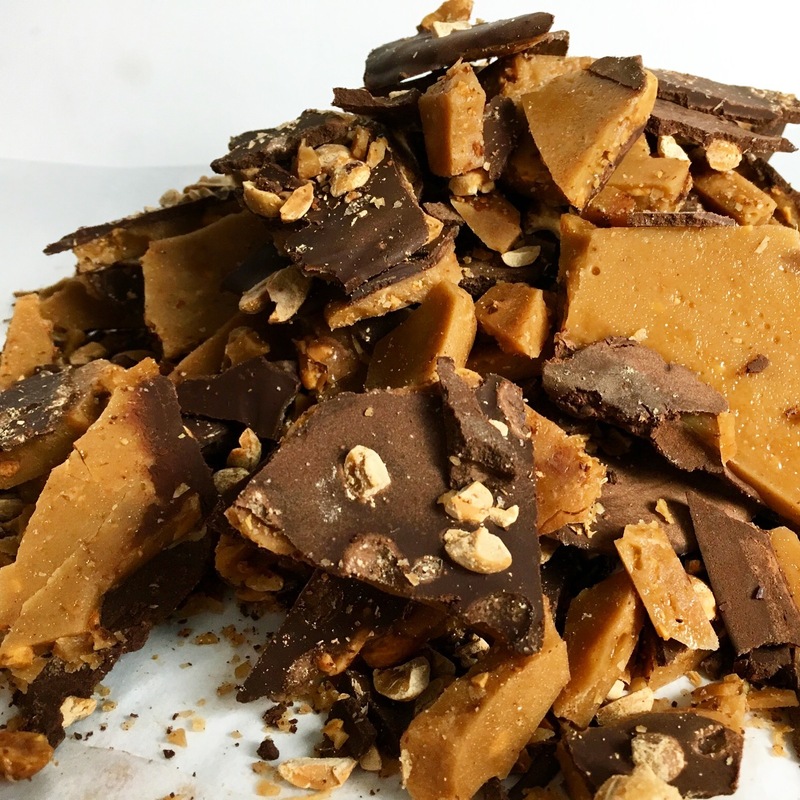 The Butter Toffee will keep for several weeks in an airtight container at room temperature. When using an untempered Chocolate coating, storing the Butter Toffee in the refrigerator will help to keep the Chocolate firm. 1. Roast the Peanuts: Preheat the oven to 350 degrees Fahrenheit (177 degrees Celsius). Place the Peanuts in a mixing bowl and toss them with the Vegetable Oil and a pinch of Salt. Transfer the Peanuts to a parchment lined sheet tray in a single layer. Roast the Peanuts until they become fragrant and begin to brown - approximately 15-20 minutes. Remove the Peanuts from the oven and set them aside to cool. 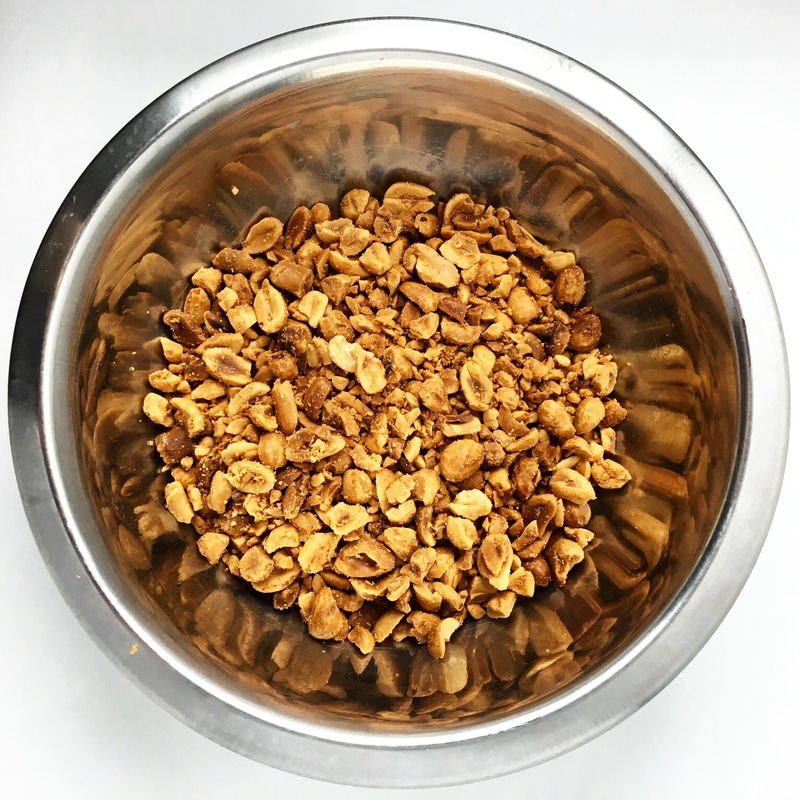 When the roasted Peanuts have cooled, roughly chop them in a food processor. Chef's Note: Always keep a close eye on nuts in the oven. They can quickly go from perfectly roasted to burned. 2. 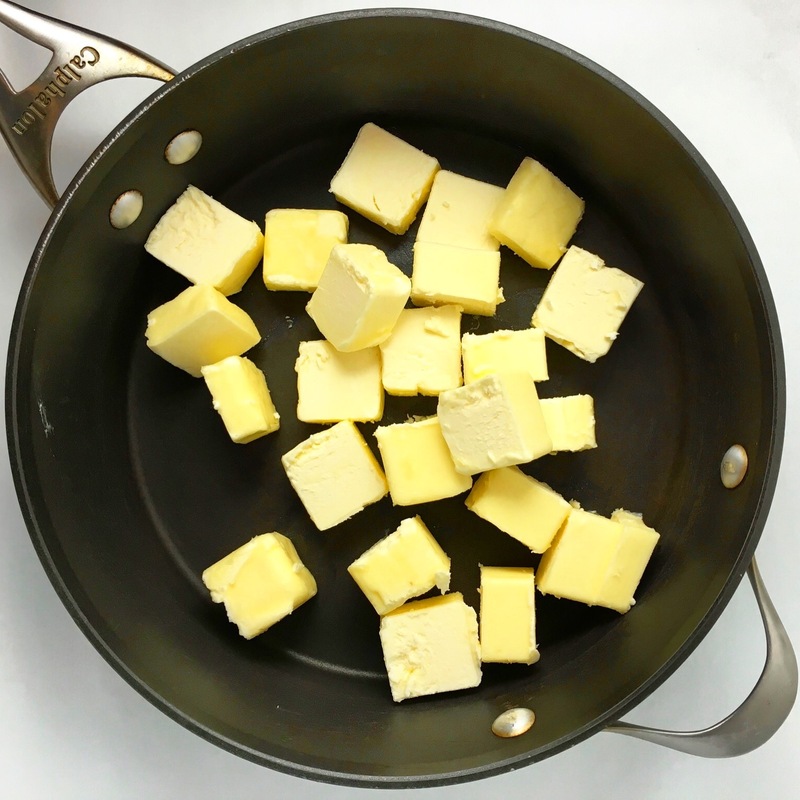 Make the Butter Toffee: Cube the Butter and melt it in a large pot over medium heat. When the Butter has melted, whisk in the White Granulated Sugar and Corn Syrup. Increase the heat and bring the mixture to a boil while actively whisking. Chef's Note: Absent any emulsifiers, melted Butter and Sugar do not combine well. Active whisking will help to keep the ingredients from separating. 3. Continue to heat the mixture to at least the Hard Crack Stage: 300-310 degrees Fahrenheit (149-154 degrees Celsius). The mixture should start to turn amber as the milk solids in the Butter begin to brown. Do not allow the mixture to burn. 4. 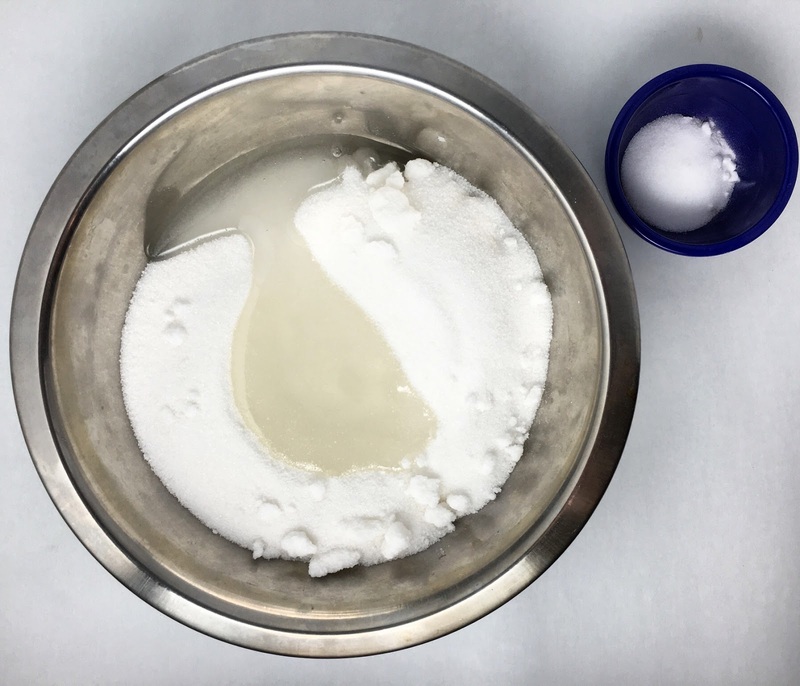 As soon as the target temperature is reached, remove the pot from the heat and immediately whisk in the Baking Soda and Salt. Immediately follow by stirring in half of the chopped, roasted Peanuts with a wooden spoon. 5. Pour the hot mixture onto a sheet tray lined with a silpat in a thin, even layer (you can also line the sheet tray with parchment paper that has been lightly coated with non-stick spray). Set the Butter Toffee aside to cool and harden. 6. Once the Butter Toffee has cooled, temper the Chocolate. Using an offset spatula, spread the Chocolate in a thin, even layer over the surface of the Butter Toffee. Sprinkle the surface with the remaining roasted Peanuts. Set the coated Butter Toffee aside to set. Chef's Note: For those not up to the challenge of tempering Chocolate, it is possible to use good-quality Chocolate that has been gently melted over a double-boiler. Melted but untempered Chocolate will not set with the same shine or have the same smooth texture as well-tempered Chocolate. It may also remain "tacky" at room temperature, making refrigerated storage necessary. However, particularly if you are planning to eat the Butter Toffee shortly after it is made, this is a perfectly acceptable alternative. 7. When the Chocolate has set, break the Toffee into bite-sized pieces. - The Butter Toffee will keep for several weeks in an airtight container at room temperature. - When using an untempered Chocolate coating, storing the Butter Toffee in the refrigerator will help to keep the Chocolate firm.